The 250 Parilla Wildcat was almost unique in the Hicam range of models in that it used very few components – other than the engine – which were common to any other model. Even the engine was unique in its state of tune, the final series engine being the most powerful of any of the hicams. Parilla Wildcat bushes old & newFrame, forks, tank, seat, mudguards & seat were all “Wildcat only”. If you have rebuilt, or are rebuilding, a Wildcat you will recognise that many of the smaller parts are unique too. Even the seemingly conventional, if rather beefy, OE suspension units have a surprise in store – the conical rubber mounts are a very odd size. 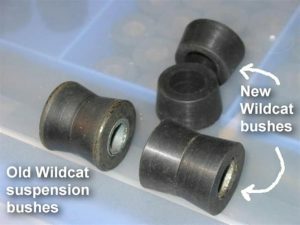 I have a few sets of rear shocks to rebuild for my Wildcat projects & several of them have badly worn or degraded bushes. Searches on the net & at jumbles & scambios turned up nothing suitable. Some bushes were found which would have been quite a close fit but were far too soft to survive & given they were not exactly right were discounted. I contacted Ariete & sent samples via the UK importer but nothing in their catalogue was suitable. It seemed like I would never get any other than finding some NOS. Even that can be a mixed blessing as the old rubber compounds degrade & harden on the shelf. Not as much as those which have been in use but a suspension bush takes some hammering in use & the thought of NOS ones breaking up wasn’t one I wanted to contemplate. We would rarely think using 40 year old NOS tyres or engine seals in a rebuild was best practice. So I decided to look for a manufacturer in the UK capable, & willing, to make me a small batch of bushings. I found one late in 2008 – oddly only 10 miles from my home. They made me a trial batch of tank mount rubbers for the road style tank mounts & I was convinced these guys could do the suspension bushes to a high standard. I commissioned a mould from them – each conical bush is moulded, cured & trimmed by hand – & a short production run was begun. Its a time consuming business as the mould makes only one bush. If I’d wanted to go into a bigger run a second mould would have costed in. As it was it took one guy two days to hand mould & cure my run. 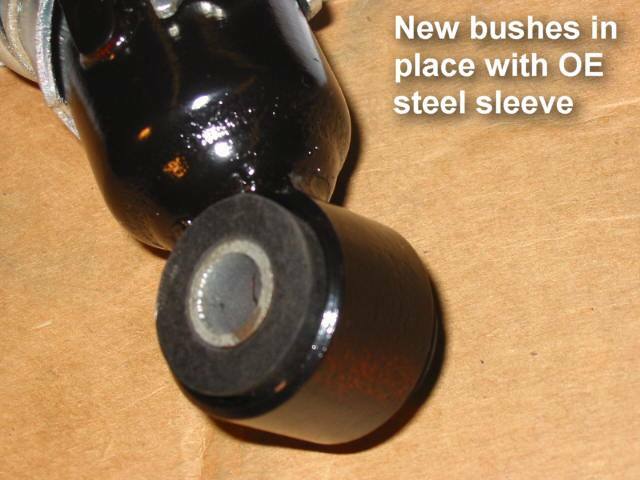 The outcome is that these bushes are quite expensive – almost double the cost of the tubular tank mounting bushes. I have enough for my restoration needs & a few sets which I can sell if anyone needs them. I can only sell as full sets i.e 8 bushes to fit a pair of shocks.